Team Hummer Storm Racing is very excited to launch their new off road racing team and have assembled a team of 25+ seasoned professionals to insure that while we are new on the circuit we will immediately be very competitive. 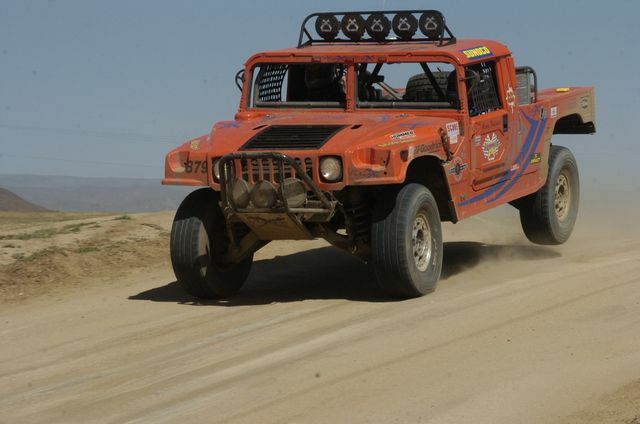 Track Team Hummer Storm live in the Baja 500 ! Click here to go to the IRCTracking site; We are under Class 8, vehicle #879. (You must have Flash installed to use this site). Team Hummer Storm named 2006 SNORE Stock Full Champion. Dubbed “The Green Team”, Team Hummer Storm is the only off-road vehicle to be powered by Bio-Diesel, a fuel produced from renewable resources like palm, soy or canola oil. It can also be made from recycled fryer oil, and it produces nearly 80% less pollutants than petroleum based fuel. “The Green Team” will be participating in the Score International Off-Road Racing circuit for the 2007 season. In 2007 we will participate in the San Felipe 250, Baja 500, Primm 300 and Baja 1000. Please check our schedule. This gives team sponsors the opportunity to showcase their products to hundreds of thousands of spectators.